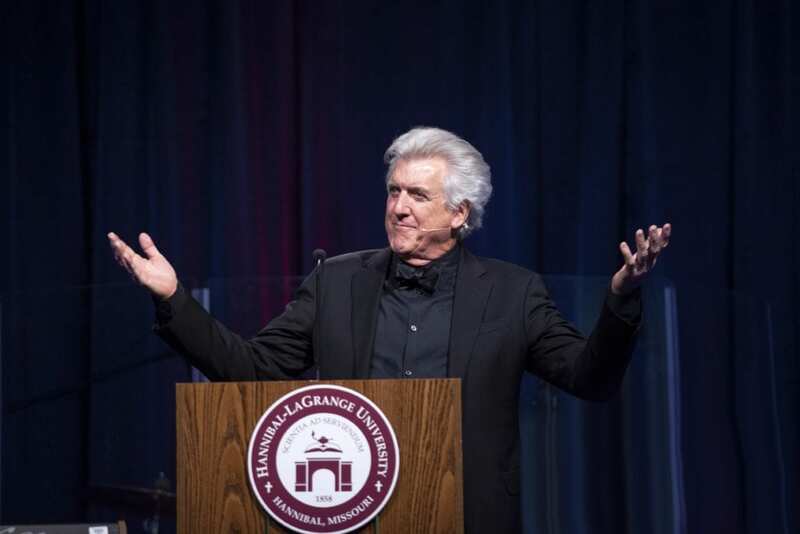 Despite the snowy and cold weather, 475 people were in attendance for HLGU’s 77th Annual Booster Banquet, this year featuring Luke Zamperini, the son of Louis Zamperini, the famous Olympic Athlete and WWII POW. Recounting his father’s miraculous story of perseverance and survival, Zamperini’s message focused on his father’s faith and the power of forgiveness. He relayed stories of his father’s thievery as a kid and how his brother helped him change his focus from running from the police to running for competition, eventually running his way to the 1936 Berlin Olympics and the record for fastest last lap in the 5000 meters. Zamperini talked about his father’s experience during WWII, how he crash-landed in the Pacific and was stranded at sea for 47 days, only to be rescued by the Japanese and brutally mistreated in Japanese POW camps for two years, horribly beaten every day for 14 months by a guard called the Bird. Zamperini said that when WWII ended, his father’s battle with PTSD began. It dominated his life for the next five years until he was taken to a Billy Graham Crusade where his life was changed forever by the salvation of Jesus Christ. Later, Louis Zamperini traveled to Japan to visit a prison filled with his former guards. While there, he forgave them, shook their hands, and led several of them to Christ. He then went on to speak about how his father learned First Aid as a boy scout and was able to help save his pilot friend when they crash landed, how he learned that bullets lose their velocity in a few feet of water and was able to avoid getting shot when a Japanese plane came to strafe them. He learned how to avoid being eaten by a shark from a class he took while stationed in Hawaii, and he learned in a college physiology class that the mind is like a muscle; if you don’t use it, it will atrophy, so he would recite various things while at sea in order to keep his mind sharp. In addition to Zamperini’s address, those in attendance at the banquet heard from two students, Romy Massey and Joshuwa Scott, about how they received scholarships to attend HLGU and it has changed their lives. Prior to the student testimonies, HLGU’s ministry team, Praise Song, took the stage to perform a selection of their praise and worship pieces from the semester. The event was sponsored in part by HNB Bank and WGEM, and the evening was closed out by Dr. Anthony Allen, HLGU President, who appealed to those in attendance to support the students at HLGU. For more information about HLGU’s annual Booster Banquet, please contact Lauren Youse, director of alumni services and development at 573-629-3126, or via email at lauren.youse@hlg.edu.